Upon the flight into Space to repair and upgrade “the world’s first space-based observatory, 350 miles above the Earth”, Hubble Space Telescope, a team of astronauts returned with footage from an IMAX camera along with breathtaking images taken by the telescope over the last 20 years. 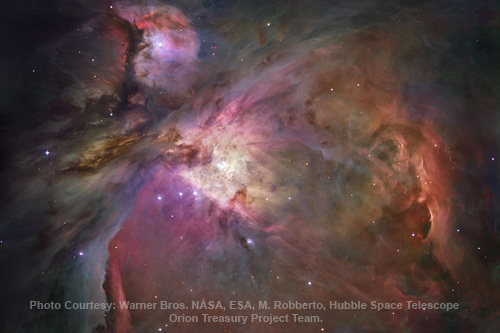 The sharpest view of the Orion Nebula captured by the Hubble Space Telescope's Advanced Camera for Surveys. This science documentary is a great escape, and allows viewers to experience what a space visit is like through the first-hand perspective of the STS 125 Mission NASA astronauts. Audiences will get inside the astronauts head with narration by each of them on their thoughts as they prepared for the flight back in May 2009. Supplemental narration is provided by award-winning actor Leonardo DiCaprio whose voice describes actions of the astronauts as well as supplying educational information on stellar images taken by the telescope. This film is 43 minutes long, which is not quite enough time to really explore into the depths of space. More interaction between the astronauts while in space would have been great. However, audiences will find out how astronauts take showers in space. IMAX director, Toni Myers explained that it was her intent to leave viewers wanting more. Well, she certainly achieved that. “Hubble 3D” opened in selected museums, science centers and IMAX theaters worldwide on March 19th. It will be commercially released in April.